It's sad but what we expected is true. Now is the time to look for a new game and hopefully we can use the comments to find one. Well whatever new game you pick, make sure it's not zynga... all those years of work and it can be gone any second, I guess that's life for ya.. Seriously? Lives wasted with meaningless "accomplishments." go outside... There is a great world out there. Same here - been playing since early 2009, and it's a big reason I log into Facebook every day. The upside is that I'll have more time to do something useful now, but I'll still miss this game. Despite its many issues, it was still entertaining for all these years. I think I'm done with FB games after this. Same here, since 2009. I personally didn't like MW very much since South Africa came up. The game became ever more greedy, absurd and time consuming since then. So I take it easy but I guess some people must be suicidal now ? ;-) The only Zynga game so far I'll continue playing ist their Poker. If this is true then Zynga are truly fools - it was the only game worth playing and I also will miss my Mafia family madly - I think we should boycott all Zynga games!!!! not just a made up date so Zynga can get an event out of it. That's good for any online game not just a Zynga one. Shame they couldn't see it through a decade with 79K players they could have easily seen another year out just for the achievement. Thank you so much for everything you have done Jen. I'd have been done with this game about 4 years ago if it wasn't for this blog. I really feel sorry for the people that gave up there hard-earned 25 bucks a month just to play a game that ZYNGIMME$$$ just drops. SO every single F'N' Zyngimme$$$ GAME will be DROPPED from my life. Yes, we all could see the writing on the wall. I have so enjoyed not only this game but meeting the many people from all over the world! I will definitely miss the camaraderie. Tho I would love to find another game to play, I am not into "farming" or "poker". Thank you Jen and LL for everything you have done for us. I will miss checking this blog and the FB page. Zynga has really screwed itself now. Loyal players for years been treated like this. Pathetic and no class just money hungry. And they are going to put their energy in some new game which no one is going to play anyways after this. Aunts is like the titanic now. I am going to miss the social interaction and daily routine. So much gratitude and thanks to you and your team. I havent really been playing the last year do to work, i have posted my links daily, but i couldnt really play any and i also kinda got abit tired of the game, barely had time to finish Mexico before LA came out and then booooom, Japan, so i could only get to district 3 in LA, wish they slowed that bit down and the game would live a tinybit longer, but thats how it is when you rush things. Kinda sad to see it go, spent my last 5-6 years playing the game, thanks to my brother i started in 2009, but I guess now is a good time to spend my 7k rp points ive been saving up the last 5 years, I have spent some, but that was ONLY an accident, lol, I accidentally bought off one of the extreme missions many years ago due to a miss click and i hadnt activated that spockholm confirmation button, that got activated right away after that lol, was done a month early with the mission though, haha. So long mw, you will be missed not matter what, it was alot of fun no matter how you put it, goodbye MafiaWars, goodbye. I doubt you'll remember me because I quit MW cold turkey about 4 years ago. I was the person who owned the Tankchair and was surprised to see MY offroad wheelchair drop in the game. It was obviously my chair as newer models were built differently and other copycat chairs had a much different chassis and tread. After much good natured correspondance between myself and Zynga asking them to give the fellow who invented my Tankchair credit, they agreed to change the name of the game loot. The inventor and myself signed permission forms for Zynga to use the image. Once that was done we heard nothing more about it and Zynga never answered any more emails regarding the matter. I haven't played a Zynga game since. They've been a dishonest company in my opinion. How about us MW players finding some other game to migrate to and colonize? Any suggestions as to which? Mob Wars has filed a lawsuit against Zynga for copyright infringement for stealing the basis of MW from Mob Wars. THAT is why Zynga is shutting Mafia Wars down. I am very sad to see the game end. I will especially miss the many friends I have met all over the world from playing. It was a real time waster though. I do not think I will be transferring to another game. Zynga will be losing my business completely. I was planning on finishing Japan and then quitting anyways, so this is great news as with the 10x mastery I no longer have to worry about building up consumables. I can used all of the reward points I saved up just to level so I can finish off Japan faster. I may even be able to do it today! I wanted to quit playing about 2 years ago but since I started my family I felt I would be letting them down by doing so. So kept playing, and it's been a bad habit of mine for a long time. I'm a competitive person so just playing wasn't enough, I had to do well to derive enjoyment. I'll miss the people from the game, especially you Jen for providing a useful resource, but I certainly won't miss Zynga. I don't plan on ever playing another Zynga game again. 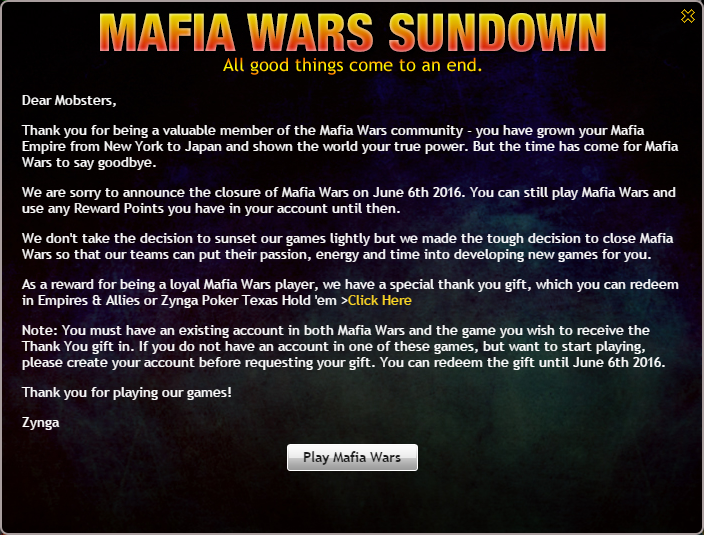 Zynga is not going to be around long if they drop Mafia Wars! Deactivated all zynga games this morning including MW. Taking a short position on their shares too as I can see them heading south very quickly. Made a couple of percent just today but plenty more to come over the coming months. They're screwing themselves and i will take great pleasure in profiting from it. What they've taken away in MW I will take back in dollar bills lol. If Mafia wars goes so will I , I won't be playing any other Zynga games. Since they are closing and there are 10X mastery, I wish they would do so we didnt need any loot or money to do the jobs, I wish that so i could finish the jobs, havent even started on Japan, got only to district 3 in LA. But MafiaWars, we are sad to see you go, its the game ive been playing longest I think and I play alot of multiplayer games on my PC, its either the longest or its tied with another game, hehe. A lot of people spent real money on this game. And yet this is the result. Lesson I've learned. Never spend real money on a virtual game because it isn't tangible and can be taken away from you in a second. I will also be boycotting Zynga. For now I am playing a game called "Island Experiment" You start out on an island that's pretty hostile and you have to fight carnivorous spiders and build up your island and then there's an entire archipelago of islands to set sail for all of which have interesting prospects. There are also strangers washing ashore, and some of the other islands are inhabited. You never know if they're going to be hostile or friendly, So far it's been kind of fun. I'll never understand how people can throw away thousands of dollars just to increase some numbers in an online game like this just so they can 'win' against someone. I'm happy to say I havent put more then maybe $120 into this game since the beginning and haven't spent a penny in the last few years. All that money thrown away to those greedy corporate suits could have been spent on something tangible, like a nice vacation, a new car, or something. I won't miss this game once it closes, I'll still be able to talk to the friends I have made worldwide. a petition is on the way for avoid the shutdown: https://www.change.org/p/frank-d-gibeau-stop-zynga-from-closing-mafia-wars?recruiter=523158743&utm_source=share_petition&utm_medium=facebook&utm_campaign=share_facebook_responsive&utm_term=des-lg-share_petition-no_msg&fb_ref=Default go sign it if u want . I, for one will miss the game as I have met some good people through playing. I plan to keep in touch with you all but my only regret is the fact that I, amongst others have spent quite a lot of money to get where we are in the game and now Zynga have decided for me that it was all for nothing. I won't be playing any of their games in the future. It has been fun though. Hope to see you guys and gals out there in game land. Try Xbox, actually decent games on there! Mafia Wars (Zynga) should be investigated. Did they really ever donate money to the charities they said they would donate to? In selling certain special loot they promised to donate to things like earthquake relief, hunger etc. Wonder if they ever really did, and if so, how much? Always wondered if it was real or a scam. Why don't you get yourself a life?? Who the hell cares? If you didn't care 4 years ago about the donation,why the hell start caring now? Just beacause they close a game and thereby destroying your whole life?? You have a serious addiction problem...and you should be VERY VERY VERY happy that this game will be no longer... trust me. Seek help and get away from Facebook and gaming for at least a year... by then you will look back at your lame comment and think to yourself "What the HELL was I on?" Find a new Game lol I quit Mafia wars 2 days ago because of the shutdown and will never play another Zynga game!! MW, for me too, has been the only reason to login to FB. Gonna miss my family, friends & allies, a lot. My sincere thanks to all my mw friends! you've been absolutely wonderful, so generous and helpful. Scopely's Walking Dead: Road to Survival ...so much more fun...and oh-so-mobile! AMAZONS have migrated to Mob War La Costa. It is mafia wars on steriods. No Zynga games ever for me that is for sure. LCN internal chat, internal requests, perks, dailies, fighting, jobbing, helping, bossfights and wars. Only 25 members in the family but they are looking into raising so Mafia War groups can migrate the whole family. Try it. Play Boom Beach!!! It is the hottest game for over a year and make friends in task forces!!! More intwractive than MW and is animated. CoC is good too! SuoerCell games ROCK!!! I had a dream about playing mw 6 months before I started playing, didn't recognize it at first, then it just hit me. MW was huge in my life, it lead me out of depression, I started opening up to people and communicating freely, I traveled abroad to meet two of my best mw buddies. It's because of mw i started learning photoshop and lost my fear speaking English. Yes, mw was time consuming but also rewarding. I'm happy i quit playing before seeing it end, but yet i'm going back to this blog to read some mw talks. Now, imagine if any mw bullet triggered a bullet in real life. We as human beings are gifted the power of materializing our thoughts. We just have to make our brain work out, quit the slacking, add love and soul to it. And that's it. Put our hearts into a dream. Exercise the right to be human every day. Dreams are the only thing that makes us superior to animals. Despite everything being said by now, I've really missed MWs, and its thrills, while reading its lines of short stories, chatting with friends and Mafia family members, the logic behind every step taken, orders of actions to be taken one after another so to keep an eye on resources and their expenditure, and ... many more. In short, I've really missed the while Mafia Wars. Now, guys, have you found another game similar to this one? with many little actions, to be shared with other family members? Please share them. Recognizing the uselessness of online fantasy game play, I broke the MW addiction, cold turkey, in 2012. So glad I did for I did not realize how much time I wasted in my life on this nonsense and how I was allowing it to rob me of actual human interaction. No tears shed for this shutdown!